In the forex market, the rupee, after hitting yet another record low of 74.50 against the dollar in early deals, turned positive in late afternoon trade and was quoting 24 paise higher at 74. 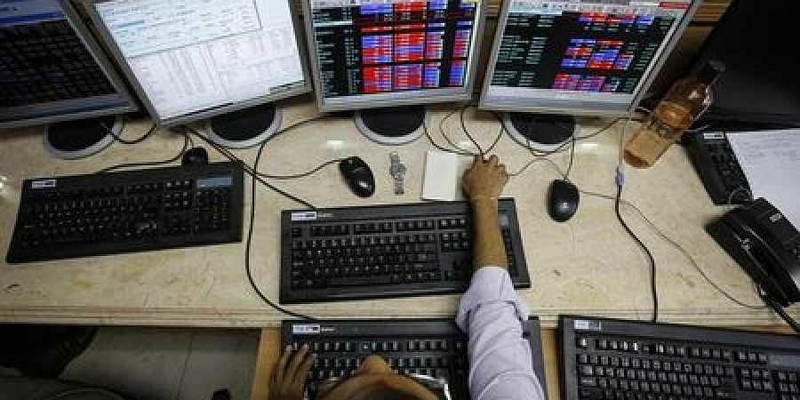 MUMBAI: The BSE Sensex slumped over 750 points to end at a six-month low and the Nifty ended below the 10,300 mark Thursday as global indices witnessed across-the-board losses after investor sentiment was hit by heavy sell-off in world markets. Continuous outflows by foreign funds also added to investor woes. The BSE Sensex which commenced with a gap down opening, cracked over 1,000 points, breaching the 34,000-mark and hit a low of 33,723.53, before staging a partial recovery to touch a high of 34,325.09 in afternoon trade. The gauge finally ended 759.74 points, or 2.19 per cent, lower at 34,001.15. This is the lowest closing since April 11. It had gained 461.42 points Wednesday. The NSE Nifty settled at 10,234.65, down 225.45 points, or 2.16 per cent. It moved between 10,138.60 and 10,335.95 in day trade. "The market sell-off is part of the global sell off triggered by the sharp cut in the mother market US," said VK Vijayakumar, Chief Investment Strategist at Geojit Financial Services. "The US economy is doing very well, so much so that inflation has started creeping up. The US 10 year bond yield, the risk free asset in the world, is around 3.15 per cent. This is triggering capital outflows from EMs like India. Apart from the rising yield in the US and EM currency woes, there are global trade skirmishes impacting the sentiment," he added. Asian stocks ended lower and European stocks too slumped to over 18-month low in their early session Thursday, tracking overnight worst losses in eight months on the Wall Street Wednesday. In the forex market, the rupee, after hitting yet another record low of 74.50 against the dollar in early deals, turned positive in late afternoon trade and was quoting 24 paise higher at 74 as Brent crude slipped below the USD 82 a barrel and dollar weakened overseas. Meanwhile, foreign portfolio investors (FPIs) offloaded shares worth Rs 1,096 crore, while domestic institutional investors (DIIs) purchased shares worth a net Rs 1,893 crore Wednesday, provisional data showed.